Accepted Scientific Name: Escobaria vivipara (Nutt.) Buxb. Origin and Habitat: Native to Arizona and New Mexico. Altitude: Altitude between 1100 and 1600 m.
Habitat: Semi-arid scrubland or grassland filled with desert annuals mostly on low hills or mountain tops. Often both clumps of Coryphantha and Echinocereus rigidissimus grows nearby in the prairie. Often snow-covered in winter can withstand temperatures below freezing for a long period of time! 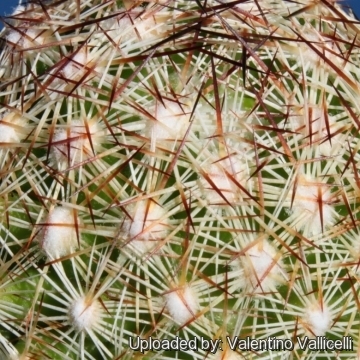 Coryphantha vivipara var. bisbeeana f. sonorensis P.C.Fisch. 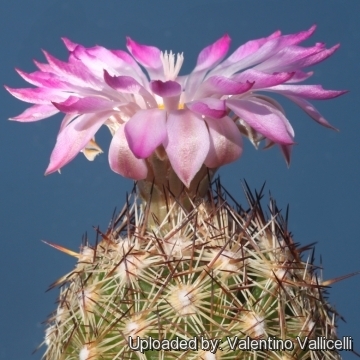 Coryphantha vivipara f. sonorensis P.C.Fisch. Mammillaria bisbeeana (Orcutt) Orcutt ex Backeb. Escobaria arizonica (Engelm. in W.H.Brewer & S.Watson) Buxb. Mammillaria radiosa var. arizonica (Engelm. in W.H.Brewer & S.Watson) K.Schum. Coryphantha vivipara var. buoflama P.C.Fisch. Coryphantha vivipara var. kaibabensis P.C.Fisch. 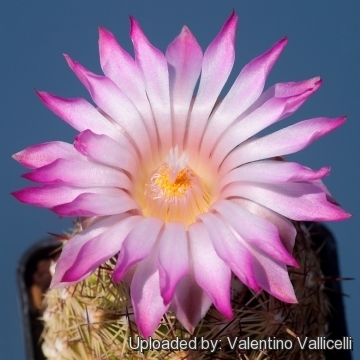 Cactus radiosus var. neomexicanus (Engelm.) J.M.Coult. Coryphantha vivipara var. neomexicana (Engelm.) Backeb. Mammillaria vivipara subvar. neomexicana Engelm. Coryphantha vivipara var. radiosa (Engelm.) Backeb. Mammillaria radiosa var. neomexicana (Engelm.) C.F.Först. Mammillaria vivipara subs. radiosa (Engelm.) Engelm. Mammillaria vivipara var. radiosa (Engelm.) Engelm. 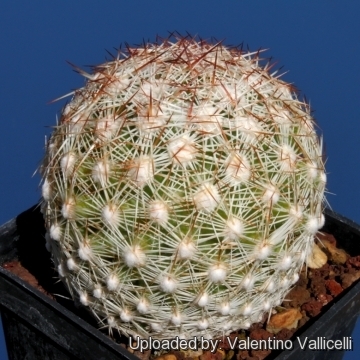 Coryphantha alversonii var. exaltissima Wiegand & Backeb. in Backeb. Cactus radiosus var. deserti (Engelm. in W.H.Brewer & S.Watson) J.M.Coult. Coryphantha chlorantha var. deserti (Engelm. in W.H.Brewer & S.Watson) Backeb. Escobaria deserti (Engelm. in W.H.Brewer & S.Watson) Buxb. Mammillaria radiosa var. deserti (Engelm. in W.H.Brewer & S.Watson) K.Schum. Escobaria chlorantha (Engelm. ex Wheeler) Buxb. Cactus radiosus var. chloranthus (Engelm. ex Wheeler) J.M.Coult. Description: Escobaria vivipara var. 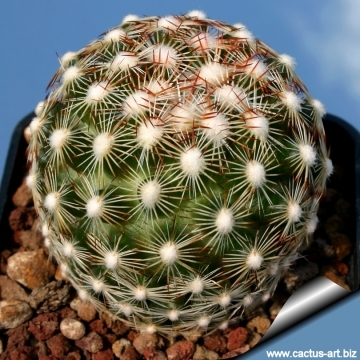 bisbeana is a small solitary or clumping cactus that form small colonies over time. It is densely covered in a mat of star-shaped arrays of spines. Stems: Spheric, ovoid, obovoid, or cylindric with age, 2.5-7,5 × 3-11 cm tall. Tubercles: Grooved, 8-25 × 3-8 mm, stiff or ± flaccid; areolar glands absent. Roots: Mostly diffuse or moderately enlarged, but less than 1/4 of stem diameter. 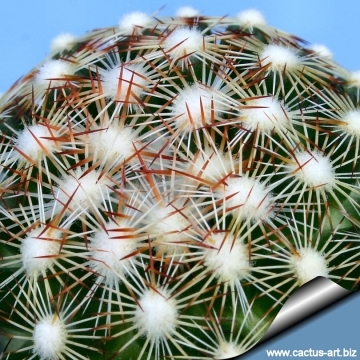 Spines: Approx 25-35 radial per areole weakly tightly appressed, pectinately arranged in subadults plant, vitreous bright white with reddish brown, or pinkish orange tips, fading, then blackening with age (dark tips rarely absent). Subcentral spines are sometimes present. Central spines: Only in adult specimens, straightt; 3-14 per areole; slightly projecting, in "bird’s-foot" arrangement or radiating like spokes, longest spines 9-25 mm. Flowers: Subapical, 20-65 mm long; pale rose-pink to magenta. Fruits: Green, exposed portions slowly turning dull brownish red, juicy; floral remnant persistent. Escobaria vivipara var. arizonica (Engelm.) D.R.Hunt: (Arizona Spinystar) - it is native to the desert southwest of the United States. Escobaria vivipara var. bisbeeana (Orcutt) D.R.Hunt: (Bisbee Spinystar) - It is native to Arizona and New Mexico. Escobaria vivipara var. borealis n.n. : same as Escobaria vivipara var. neomexicana (Engelm.) Buxb. Distribution: New Mexico. Escobaria vivipara var. deserti (Engelm. 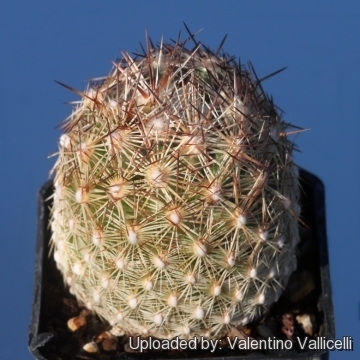 in W.H.Brewer & S.Watson) W.T.Marshall: has cylindrical stems densely covered with spines. Flowers dirty-greenish-yellow to dull rusty-brown. Distribution: Southern Nevada, eastern California, southwestern Utah, and northwestern Arizona. Escobaria vivipara var. neomexicana (Engelm.) Buxb. in Krainz: (New Mexico spinystar) - It is native to New Mexico and Texas. Spines nearly always white. Escobaria vivipara var. radiosa (Engelm.) D.R.Hunt: is native to Texas ( Hood, Wise, Brown, Hamilton, Montague and Young Counties),USA. 2) Terry, M., Heil, K. & Corral-Díaz, R. 2013. Escobaria vivipara. The IUCN Red List of Threatened Species. Version 2015.1. <www.iucnredlist.org>. Downloaded on 13 June 2015. 5) Castetter, E.F., P. Pierce and K.H. Schwerin. 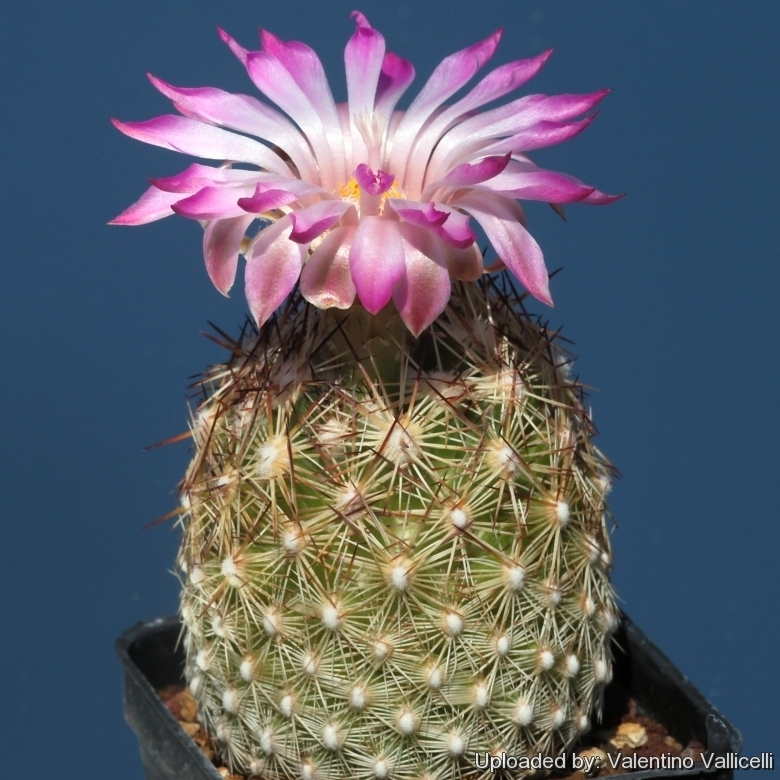 “Reassessment of the genus Escobaria.” Cactus and Succulent Journal (US) 47(2):60-70.1975. 8) Flora of North America Editorial Committee. “Flora of North America, volume 4.” Oxford University Press, New York.2003. Cultivation and Propagation: It comes from an area of summer rainfall. Keep drier in winter (but for outdoor cultivation it is very resistant to wet conditions, too). It needs good drainage. Very cold resistant, but the frost resistance varies a lot from clone to clone. It can easily be grown outdoors in areas with minimum winter temperatures of -15 -25°. It needs full sun to light shade.